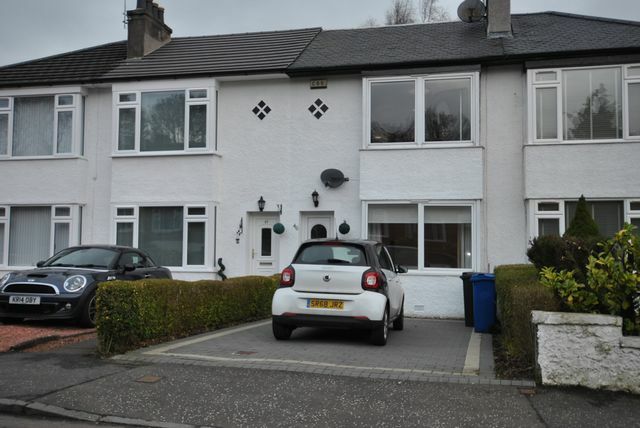 Lovely mid terrace 2 bedroom family home with additional attic room in ever popular Bearsden. The property comprises bright front facing lounge with feature fireplace leading to the well-appointed breakfasting kitchen and a convenient under stair storage cupboard. Access to the back garden which is lawned and has decked area and large shed to the rear. Upstairs there are two double sized bedrooms with a fixed stairwell from bedroom one allowing access to a floored and lined attic space providing excellent additional storage. Bathroom with a three-piece white suite and over bath shower. Front driveway with sapce for 1 car. GCH. Double glazing. Located on Iain Rd offering fantastic schooling at Bearsden Academy and St Andrews and Castlehill Primary, local shops, parks and access into the city in 20 mins.